This week I had the fantastic opportunity to talk to my daughter’s 9 year old classmates, about how they can be “sugar smart”. 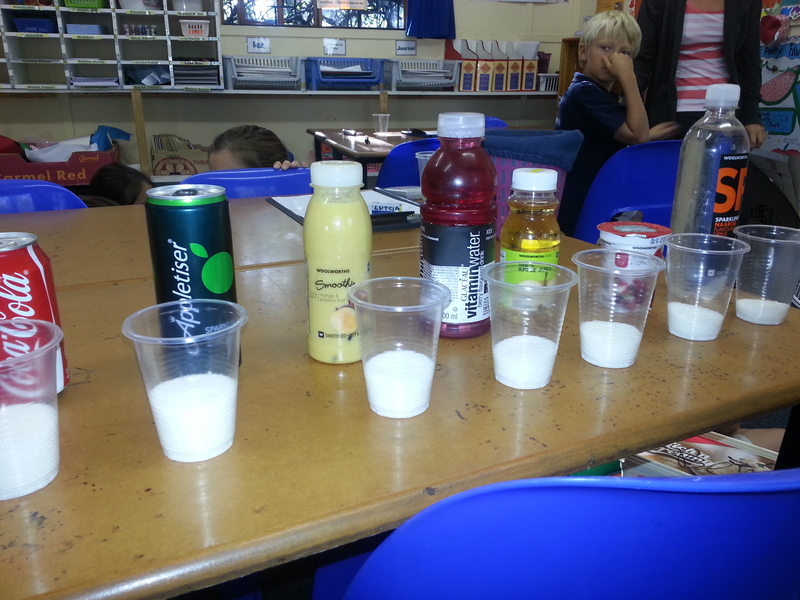 Her class had been learning about nutrition and how the choices they make impact their health. The teacher left it totally up to me to decide what to talk to them about. I literally jumped at the chance to inform them how to be “sugar smart”. This post will teach you that important life skill too. In my preparation for the talk I thought it would be prudent not to use scare tactics on them. I really didn’t want any phone calls from upset parents telling me that their child was having nightmares about the sugar monster trying to kill them with obesity, diabetes, heart disease and cancer! I decided it would be far more powerful to visually demonstrate how much sugar there is in certain foods (even those that are marketed as “healthy” for them). I believe that the first step to making better choices is knowledge. Without knowledge we are powerless against the very clever forces of good advertising. Processed food companies are NOT prioritising the health of their consumers – they are prioritising profits. According to the World Health Organisation’s new draft guidelines, young children ideally should be having no more than 3 teaspoons of sugar per day and adults no more than 6 teaspoons. The reality is that most people are having way more than that which explains the rampant obesity and diabetes epidemics (which are affecting children too). The problem is that most processed foods have added sugar. It is not just the teaspoon of sugar you are having in your cup of tea but it is also the hidden sugar in for example, breakfast cereals, fizzy drinks, mayonnaise, tinned soup, bread, tomato sauce, microwave meals and ready-made pasta sauces that need to be accounted for as well. That is why it is vital that we all become “sugar smart” and we teach our kids the life skill of how to read a food label so they can make good choices . How many teaspoons of sugar in that? During my talk I taught the children how to work out how many teaspoons of sugar there are in a food item by reading the food label. Do you know how to do that? It’s quite simple actually. Take the total grams of sugar and divide that number by 4. This will give you the number of teaspoons of sugar. Watch out for serving size as sometimes there is more than 1 serving in the package but you would eat or drink the whole thing yourself in one go. For example a 500 ml bottle of iced tea might give the sugar grams per 250 ml. This means if you are going to drink the whole 500 ml yourself, you will need to multiply the sugar grams by 2. The photo on the right was taken during my talk with the kids ,where we spooned the amount of sugar for each item into a clear plastic cup. Little eyes went wide as saucers. That was exactly the reaction I was hoping for. People often think that letting their child have fruit juice is healthy and preferable compared with something like Coke or Sprite, but what they don’t realise is that even though juice is “natural” – it is pure sugar. Children are better off chomping on an apple and drinking a glass of water. Did you know that Appletizer only has 1 teaspoon less sugar that the same sized serving of Coke? Dried fruit is also ‘natural’ but is so packed with sugar it’s quite scary – and let’s not forget the sulphur dioxide in most dried fruit too. There are also natural occurring sugars in milk products. That is why on a food label for plain milk they will still list sugar grams which is usually around 10 grams (2.5 teaspoons) per 250 ml of milk. Therefore the naturally occurring sugars in fruit and milk products still have to be factored in to your daily sugar allowance. Here are some simple tips to reduce sugar in your diet. Try and remove sugar (white and brown), syrup and honey from your house completely over time. Cut back on the amount of sugar added to coffee or tea. Try cutting the usual amount of sugar you add by half and wean down from there. Eat fresh fruit and avoid fruit juices, dried fruit and fruits canned in syrup. When baking, cut the sugar called for in your recipe by one-third to one-half. Often you won’t notice the difference. Eat full fat Greek yoghurt and flavour with fresh fruit rather than fruit-flavoured yoghurt. Use xylitol or stevia to sweeten foods and beverages. Cook your own meals using REAL food. Food that doesn’t require food labels and expensive packaging. Drink water and avoid sugary beverages like juice and fizzy drinks. The good news is that as you slowly wean yourself (and hopefully your kids) off sugar, your taste buds will change. I now find regular milk chocolate far too sweet as my taste buds have got used to 85 % dark chocolate which has less sugar. After a while a plain old piece of chilled fruit will blow your mind with its awesome sweetness. Such a treat! Good luck with all your future choices and remember – Be Sugar Smart! Reference: Some of the tips above taken from the American Heart Association website. A new movie to look forward to: See trailer below. Posted on April 13, 2014, in Primal 101 and tagged be sugar smart, how many teaspoons of sugar, sugar. Bookmark the permalink. Leave a comment.